ISIS has skillfully manipulated social media as a powerful propaganda tool. Should the online community self-censor to deprive it of free publicity? 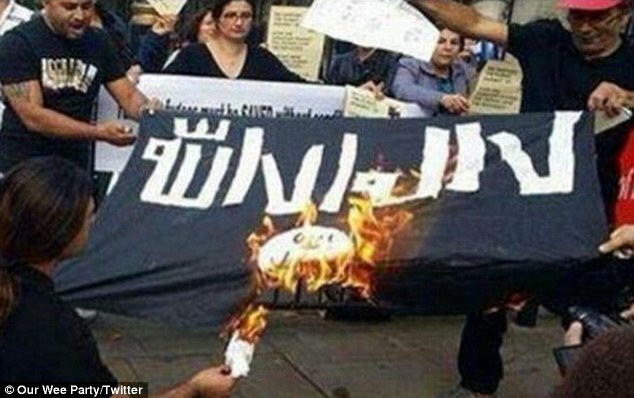 Prompted by social media, outraged Arabs and Muslims burned the ISIS flag. Quality media outlets – with their hierarchy of editors and codes of conduct – have the ability to hold or indeed withhold stories, in what they may consider the public good. Whether for ethical, legal or other reasons, though reasonably rare, there are historical precedents of newspapers and television stations, for example, choosing not to provide much-coveted coverage of terrorism events like a hijacked plane. But the internet has proven a disruptive force – both in the positive and negative sense. Disruptive in that it gave a voice and opportunity to mostly young people in the Middle East to finally speak out against corrupt, incompetent or incorrigible rulers during the Arab Spring. But today it is also giving a loud voice – and gory platform – to a fanatical few who are intent on shocking and cajoling the right-minded world into a war which it sees no immediately viable way of avoiding. They say you should not shoot the messenger, but if social media is not part of the cause it should be part of the way out of this morass. This is a naive question, perhaps even an abhorrent one, for journalists to be asking, but it’s out there now, so let’s look at it more closely. Of course, it is technically possible to censor social media from the top down, as amply shown by authoritarian states. This is an altogether different and unwelcome scenario. Here, I am speaking more of social media developing its own set of ethics or code of conduct beyond the people’s court of opinion after the offensive material has already been put out there. Already by 2008, just decades after it entered our lives, the internet had taken over traditional newspapers as a prime source of news, Pew Research reported, and for young people, it rivalled television as the main source of national and international news. Back then a lot of the content still came from traditional sources, “usually those working in struggling newspaper companies and media outlets”, according to Global Issues in a debate broadly covering the changing media influence on society and democracy. But the online world is moving fast, with the growth of citizen journalism and blogs generating original content, and the ascent of video news and sharing sites. Today, it is social media that seems to provide the Islamic State (IS or ISIS) and its ilk with an ideal forum for broadcasting their vitriol through cruel acts of violence, including horrific executions in the heart of war-torn Syria and Iraq, as well as further afield, such as the beheading of a French mountaineer in Algeria by IS-linked fanatics. It is a frightening frenzy of copycat behaviour fanned by a medium that has no genuine filter befitting the gravity of the acts. The ability to easily film and almost instantaneously upload footage of these crimes brings into question the role of today’s one-to-very-many media as a possible conduit for a whole new level of terrorism. The more intense the reaction, it seems, the greater the appeal of the medium and the greater the likelihood of repeat offenses by all manner of offshoots, affiliates and IS acolytes. How much can we blame the media for this new wave of glorified “me-too” terrorism? Can and should video-streaming sites refuse to allow – or be more stringent in their rejection of – violent content of this nature? How much should the holders and managers of these platforms be held responsible for this shocking content in much the same way as Julian Assange’s Wikileaks is being scrutinised for providing a forum for state “secrets” to be disseminated? Some tough questions, but ones that most definitely need posing. Where is the debate on the role of new media as a seed for the decline in responsible reporting. As a supporter of the liberal press and freedom of speech, this is a hard thing to even write about, let alone contemplate. But maybe the new media have a responsibility like the old media once displayed, refusing to show the graphic, the abhorrent; reducing terrorists’ ability to promulgate their propaganda with impunity, and stopping the marketing machine that is IS from recruiting disenfranchised youth from East and West to its distorted call for a Caliphate. I once described terror (in my now rather quaint book Tourism and the Media) in terms of its communication goals; and overlaid the way it works on people – remember terror is by definition to instil fear not necessarily to wreak carnage – and their perceptions in terms of basic communication (‘Terrorism represented as basic communication’ p157). In the book, I touched on the early writing of PA Karber who in his unpublished paper ‘Terrorism as social protest’, introduced the communication dimension in how we conceptualise terrorism, “as a symbolic act”. In other words, the message (terrorist act filmed) being sent by the communicator/sender and received by the audience (the terrorist’s true target) whose feedback (recipient’s reaction) is communicated back to the sender. The reactions in the case of IS are expressed in different ways, including, it now seems, the greater resolve of governments, both in the region and beyond, to stop them, in the knowledge that public support for aggressive measures is broadly accepted. The general public also “reacts” in concrete ways which “express” the fear now successfully instilled by, for example, changing their travel plans. Authorities in the West also react in terms of altering their perception of a region or people of Muslim faith or “men of Middle-eastern appearance doing nefarious things”. This kind of profiling has dangerous and far-reaching consequences on tolerance in multi-ethnic cultures like Canada, the USA, Australia and many parts of Europe. Examples of racial profiling are already coming out in Australia where the Guardian has reported a storm brewing over sensationalist journalism, press freedom and media hysteria about terrorism. It will be telling proof to see the impact on travel to Muslim-majority countries by Westerners from the nations who have been loudest and most actively opposed to IS. The terrorist act succeeds if just one person changes their plans to visit Algiers, Petra, Casablanca or largely peaceful nations in the wider region, if people start making decisions based on fear. And with potentially millions seeing these horrible acts, or even reading about them in follow-up coverage, the probability that many more people will give in to the fear grows. Perhaps the solution is to take out the middle men, remove the ability of these vile characters to get their message out so easily and effectively. It’s a thought. But is it a step too far? Does it take us back decades, or centuries… back to treating the press as a war propaganda machine? It amounts to censorship, one way or the other. It would also mean articles like this are doing nothing more than adding to the “noise” of material keeping these fanatics’ dreams alive. On the flipside, if no-one reported the events, the support for action against this threat would be so much harder to muster. Former US President George W Bush’s head-long and ham-fisted “War on Terror” in mostly Iraq and Afghanistan has brought only more trouble to a troubled region. And the loose application of the truth about weapons of mass destruction used as justification to enter this “war” doesn’t help the case for going back into the fray. Which is why the graphic nature of the crimes today (for that is what we are really talking about… Vile crimes committed by a cast of Sunni zealots, killers and misfits, to borrow from a recent story in The Economist) has worked as a wake-up call to the United States and its band of unlikely allies to go back and fix what was broken during the decade-long folly that was the War on Terror. Now that we really do have terror and the perpetrators are using the most powerful weapon they have at their disposal – mass, cheap, easy communications – to make us afraid. I think for the sake of clarity, it is worth recounting what terrorism is. It has no doubt existed in one form or another for millennia, but in its modern form, we need to go back more than a century. Anarchist terrorism captured headlines and media attention back in the late 19th and early 20th century. But for modern scholars, it reached the zeitgeist in the 1960s and 70s, and first peaked (in news terms at least) in the 1980s thanks to events such as the downing of a Pan Am flight over Lockerbie, Scotland, and tensions in Israel, Northern Ireland, northern Spain, Central America and more. Since the War on Terror commenced in the early 2000s it’s impossible to say what an act of terror really constitutes, and whether a death is a consequence of that when all parties would claim to be acting out of righteousness. But to continue on that train of thought would take us into a deep, dark recess of rhetoric and semantics on the distinction between terrorist and freedom fighter; one in which the Northern Irish have for years been digging their way out of. But with the statesman-like send-off that Ian Paisley recently received on the news of his death, it appears history is rewriting certain chapters for all of those engaged in the war/terrorism in and around Northern Ireland. So back to our (mis)understanding of terrorism. The US government once defined it as “… premeditated, politically motivated violence perpetrated against non-combatant targets by subnational groups or clandestine agents… intended to influence an audience.” While perhaps ignoring state terrorism in this equation it is a compact and functional definition. And IS and its acolyte’s violent acts on civilians, journalists and aid workers would appear to fit this description, and its use of the media to “influence an audience” works here as well. RAND, a research think tank that keeps records of terrorism trends, has expressed that terrorism should be identified by the nature of the act and not by the identity of its perpetrators or the nature of their causes. But as I mention in my book, RAND’s description could be taken too literally by the world’s mass media which keep coming back to the horrors of the act, the visible carnage, and the loss of life which unfortunately seems to boost ratings. The focus here is more on the act than the nature or reasons behind the act. Hostage-taking, beheadings, bombing, hijackings, assassinations… Audiences risk becoming addicted to the outrage, at the expense of better analysis and understanding of the causes; a trend which is likely only to aggravate the situation. What audiences must understand is that a terrorist act is intended to cause mayhem, confusion, outrage and terror, to rock the status quo. The mass media, especially social media, needs to take a good look in the mirror and ask how much exposure they want to give these people. How much graphic detail is needed to maintain support for a just ‘War for Humanity’, if such a thing could ever exist, not another improvised ‘War on Terror’? Is the information really in the readers/viewers’ best interest, or the media channel’s? Let’s stick to the tenets of good journalism, avoid sensationalising or fuelling the terrorists by over-publicising their horrible acts. Let’s try to sensibly limit the “feedback” they are craving. New figures published this week indicate that terrorism fatalities have increased almost fivefold since 9/11, and this is despite the US-led ‘war on terror’. The Global Terrorism Index reported some 18,000 deaths last year, a hike of nearly 60% over the previous year. According to the report, four groups were responsible for the majority of deaths; namely Islamic State (Isis) in Iraq and Syria; Boko Haram in Nigeria; the Taliban in Afghanistan; and al-Qaida in various parts of the world. “The terrorism index raises questions about the effectiveness of a western counter-terrorism strategy since 9/11 that has seen US-led invasions of Iraq and Afghanistan, drone strikes in Pakistan and Yemen and the use of proxy forces around the world,” writes The Guardian. The report’s release coincides with the latest Isis video showing the beheading of the American Peter Kassig, an aid worker who was posted in Syria.